Roman 1st century oil lamp with crocodile. 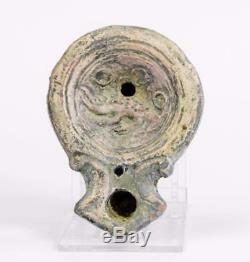 Roman oil lamp with crocodile A relatively small Roman buff terracotta oil lamp with volute-scrolls to the nozzle, the round discus decorated with a crocodile guarding its eggs. Condition: Complete and intact, surfaces a little worn. Length: 7.2 cms (2.8 ins). An interesting and early lamp with a rare discus scene. Proof of posting is obtained for all items (copy available on request). If it is possible, we will also send with tracking, but not all countries have this possibility; if in doubt, you are welcome to check with us. All items are guaranteed to be authentic, to date from the period stated, and to comply with the description provided, with no time restriction for return if not. Every item we sell is guaranteed to be authentic and to date from the period stated. Get Supersized Images & Free Image Hosting. Create your brand with Auctiva's. Attention Sellers - Get Templates Image Hosting, Scheduling at Auctiva. The item "Roman 1st century oil lamp with crocodile" is in sale since Wednesday, February 28, 2018. This item is in the category "Antiques\Antiquities\Roman". The seller is "grimstonian" and is located in West Sussex.